Contemporary artist Michael Nicoll Yahgulanaas merges Haida cultural memory with Asian brush techniques. A scene from the best-selling "Red: A Haida Manga," a revenge story. "Of all the arts of which traces remain, that of the First Nations of the Northwest coast is certainly one of the greatest." The cover of A Tale of Two Shamans. The Haida community and its art also was an inspiration to another, more contemporary artist, Michael Nicoll Yahgulanaas, inventor of a new graphic genre: "Haida manga." "Haida manga," a somewhat incongruous term, describes a hybrid form of visual expression where the artist not only celebrates Haida cultural memory and merges it with Asian brush techniques, but also engages with the challenges facing all modern societies: conflict, war, the impact of human activity on the environment, climate change and intercultural relations. Yahgulanaas brings to manga a visual and stylistic technique belonging to the cultures of the Pacific Northwest coast: the formline, or figurative line. The formline is a winding line painted in black that swells and contracts, outlining the contours of the picture's subject. 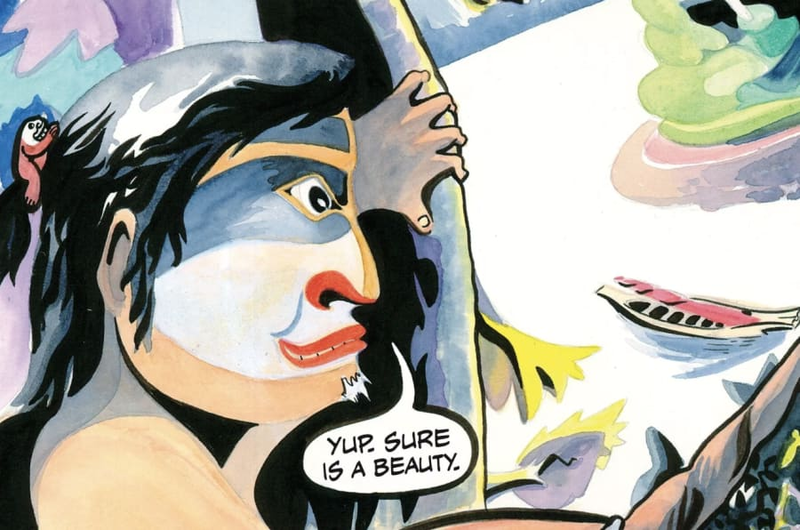 The use of formline in mangas such as "A Tale of Two Shamans" (2001) and "Red" (a 2009 best-seller), also conveys Yahgulanaas' unwavering belief that, beyond differences in Indigenous and Western ways of thinking, people of all backgrounds can find common ground in shared concerns. Yahgulanaas was born in 1954 to a Scottish father and a Haida mother from a long line of artists, who brought prestige to Haida art over the course of the 19th century. He is a descendant of the famous master sculptor and jeweller Charles Edenshaw (1839-1920), the father of his great-grandmother, on his mother's side. In his 30s, he asserted his dual heritage by adopting — alongside the surname inherited from his father — the name of his mother's clan, "Yahgulanaas," meaning those from the middle of the village, from the Raven moiety — Haida are divided into two matrilineal descendant groups, the Ravens and the Eagles. The two shamans in the town of Sk'a.aaws. From "A Tale of Two Shamans," 2011. Aware of the differences between Indigenous and non-Indigenous cultures, he strived from an early age to "play the edge between the neighbourhoods" and has clearly positioned himself at the bridge between two communities that are ignorant of, and even hostile toward, each other. Like fellow Haida artist and activist Guujaaw (Gary Edenshaw), Yahgulanaas led a fierce struggle against the deforestation of the Haida Gwaii archipelago for many years, including the famous 40-day forest-road blockade on Lyell Island, in 1985. The protest was a resounding success: the timber company backed down, and eight years later a national park was created, with agreements from both the British Columbian and federal governments. Graphic art intersecting several different worlds. Throughout the 1970s and 1980s, Yahgulanaas used his talent to serve his communities, publishing comics denouncing logging, the impact of clear-cutting and the environmental risks posed by the movement of oil takers in the Hecate Strait, running between Haida Gwaii and the mainland. According to Yahgulanaas, the use of the term manga to describe the kind of images he creates was suggested to him by students who saw him as a mangaka, or manga artist, during a trip to Japan. The author's approach is different from that of traditional artists. From "Red." He then coined the name "Haida manga." The two terms, at once opposed and complementary, encompass several key themes close to his heart, relating to art, culture, politics and identity. While Yahgulanaas is clearly proud of his roots, his approach is different from that of traditional Haida artists. A self-taught sketch artist and illustrator, he has mastered a vast range of techniques, including Chinese watercolour, which he learned in 1999 with Chinese painter Cai Ben Kwon. He also gleans inspiration from Japanese woodcuts of the ukiyo-e school — images from the floating world — and the manga tradition. Yahgulanaas strives to go beyond traditional art practices with his hybrid visual art, which draws on several different traditions — Haida, Western, Chinese and Japanese — borrowing both techniques and specific forms of representation. His stories come from the Haida oral tradition. "A Tale of Two Shamans" is a personal adaptation of a legend gathered in three local dialects by ethnologist John Swanton in 1900-1901. Like that of a great number of Indigenous artists and intellectuals in the region, Yahgulanaas draws on the great classics of turn-of-the-century ethnology (including Franz Boas), which now constitute an inexhaustible source of information on the mythology of the societies of the Pacific Northwest coast. The plot of "Red" (like many manga characters, the main character has red hair) is inspired by a true story from the distant past, handed down within the Yahgulanaas family. It tells the tale of a young man so blinded by his lust for revenge that he almost drags his community into a bloody war. Yahgulanaas' images are also inspired by visual documents and Haida artefacts. The shaman's burial box. From "A Tale of Two Shamans," 2011. Some readers will easily spot the resemblance between the drawing of the burial box containing the body of the shaman and the artefact collected at Skedans by Charles Newcombe for the American Museum of Natural History, which bears a mountain goat symbol of one of its sides. The clothes and accessories worn by the protagonists are characteristic of "traditional" dress and indicate either the character's role or social class. Box collected by Charles Newcombe. Yahgulanaas also plays with different historical periods. The face of one male character, Elder, is obscured behind a large moustache, as was the style among Indigenous men of the Pacific Northwest coast at the end of the 19th century. One of the female characters, Jaada, wears a western-style dress and carries a satchel, whereas the shaman, Spirit Dangerous to Offend, appears as a bare-breasted young woman with large hoop earrings. "A Tale of Two Shamans," p. 108.
" I use a unique blend of comic and traditional style to ask the reader to question pre-existing assumptions and fantasies about the People who produced the morally ambiguous narratives – about the Raven for instance." "I was attracted to manga because it is not part of a colonial tradition [...] and it is not linked to the colonization of our country. [Also,] manga has roots in the North Pacific, just like Haida art," he explained. "The black line becomes a prop for the characters to play with"
The line becomes the surface of the water. "A Tale of Two Shamans," p. 13. Since positive space is the place where the story takes place, the formlines are part of the narrative itself. Sometimes a scene or a character — or part of their body — spills out of the frame, encroaching on another panel. The black line is also a prop for the characters to play with, what they grab, hang off, or lean over. It is transformed into part of the landscape. In "Tale of the Two Shamans," it is the surface of the water where Elder rows his canoe. In "Red," it is part of a tree or the edge of a forest, it traces the outline of a character and, in one instance, becomes a weapon, the bow that will kill Red, as if the bow were part of a whole. The formline becomes a bow, "Red," p. 103. Some writers, such as anthropologist Nicola Levell and art historian Judith Ostrowitz, have remarked that, for Yahgulanaas, formline is not a purely formal stylistic element used in his mangas. Yahgulanaas' artistic approach goes against the grain of the Western comic tradition, with its white frames where space becomes time, structuring the narrative in a way that, for him, does not suit the Haida way of thinking. He expressed this idea in picture form, in a comedic ink sketch titled "In the Gutter" (2011), which pokes fun at the way frames are used in Western comics, attributing political and historical meaning to these blank spaces. "In the Gutter." Nicola Levell, "Michael Nicoll Yahgulanaas: The Seriousness of Play," 2016, p. 75. For Yahgulanaas, filling empty spaces or frames with images and the "full" nature of the formlines (as opposed to the empty gutter) act as a kind of history lesson. The lines denounce the commonly accepted narrative that the land colonized by Europeans was empty space — terra nullius — when it was in fact inhabited by autonomous peoples governed by their own laws. A prime example of this way of thinking can be seen in "Red." With his Haida mangas, he has opened up an international dialogue. In "Red," the assembly of images connected by the winding — and seemingly fragmented — formlines cannot truly be understood until the reader has reached the end of the book. The formlines of the panels in "Red," set side by side, form a new picture. "Red," pp. 110-111. "The mural is a way of understanding how we are all connected to each other, and moving through the same space."